Big Bad Ben has one very good section of canyon, and then a few cute narrows, and... and... it makes for a pleasant day out. The technical part is short. Some stemming and climbing, some nice bits, a pretty good rappel (careful with that anchor, please - no boltage)... But the good part is so short, it does not give much bang for the buck. Could tag Chambers on the way out. Loop route. Requires high-clearance 4WD vehicle. As little as possible. Full body armor, bunny strap, gloves, webbing to build an anchor. Commonly has pools to waist-deep. Can be higher after storms. A few narrow sections. Anchor for the rappel may be difficult to use (R). A 4WD high-clearance vehicle is required for short section of road below White Roost Campsite. Park a car at the end, then walk or spot another car 2.0 miles back along the road. 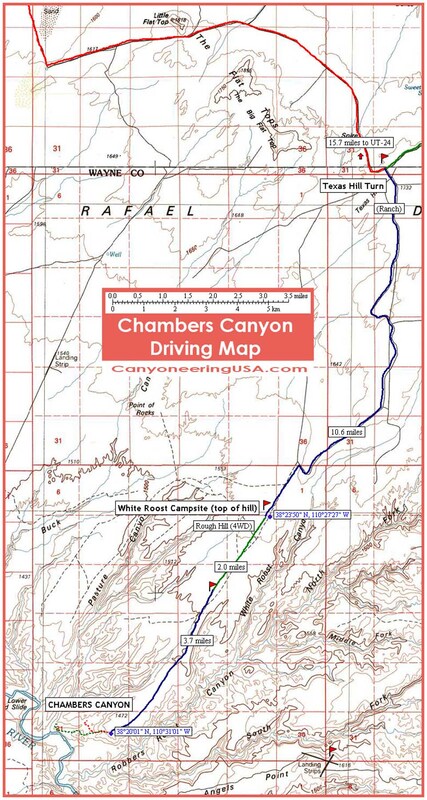 This Chambers Canyon area driving map will help you locate Big Bad Ben. Click on the image to view in higher resolution. Park a car at the end of the road, as for Chambers. Walk or drive back 2.0 miles, then head northwest to the edge of the canyon. Find a place to slip over the edge and into the bottom of the drainage. Follow it down for 1-1/2 miles to where it drops into a canyon coming in from the right. Follow the rim of the new canyon up-canyon until you can drop into the wash easily. Pad up and enter the canyon. Continue downcanyon. The good bit is quite short. Continue downcanyon about 2 miles to where a major canyon comes in from the left, almost within sight of the Dirty Devil River. This is Chambers. Climb up on the bench (left), then follow the Chambers Exit directions to get back to the top. Swagger downcanyon, enjoying the beautiful walls. Just before the canyon enters a larger canyon, a sandpile offers an enticing way up on the Left (south). Continue closer to the confluence where a series of ledges allows easier (and less damaging) access to the bench. Find a reasonable climb up to the next level of bench, then head back upcanyon along the rim, generally following the ridge, then up to the drainage, to the rimrock and back to the carpark. Up on top, you should be near your car. Either walk back to camp (2.0 miles), or grab your car spot. I descended Big Bad Ben in November 2006 with Steve Ramras and family and friends. He suggested the name Big Bad Ben to honor his friend Ben, who had just gotten out of the pen. The canyon was listed on the project map as "BBB". There are currently no trip reports or photos available for this canyon. Stay tuned - or better yet, submit your own report and photos!